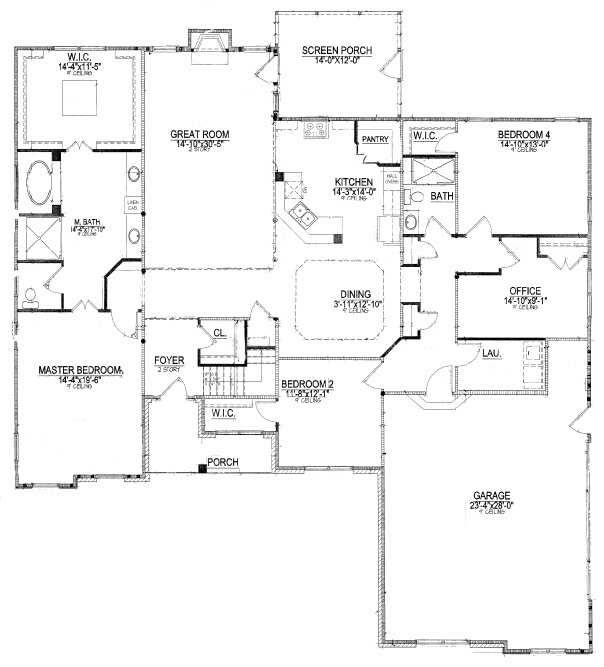 These master bedroom floor plans range from layouts that maximize efficiency to those centered on spreading out. The McAlvany -- a Frank Betz and Stanton Homes floor plan -- features a first floor master suite with laundry room inside the master closet. The master bedroom and bath each feature a unique ceiling vault and contemporary square light fixture. 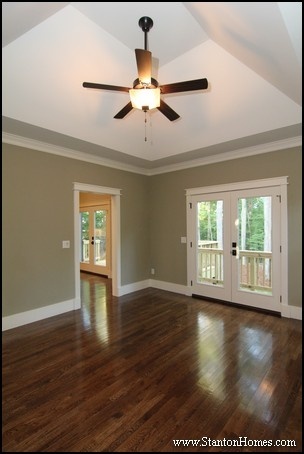 Large windows and French doors provide natural light. In the master bathroom, the upper transom windows can remain uncovered, even with blinds or curtains over the picture window. 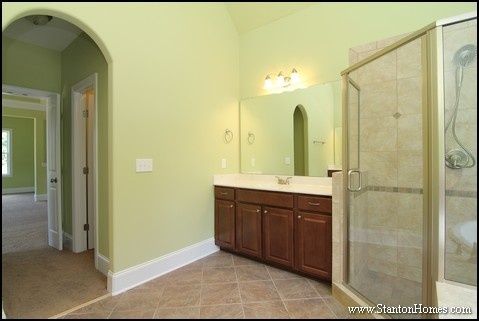 See more homes with the laundry room by the master bedroom. 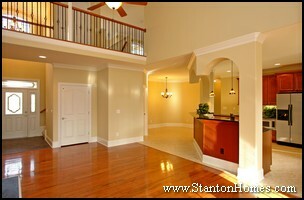 The Worthington II -- a Stanton Homes floor plan -- is a contemporary home with the master bedroom on the first floor. 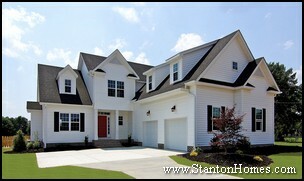 The Mastrosimone -- a Stanton Homes floor plan -- is a first floor master floor plan. This version of the Mastrosimone features a unique sitting room style - with half-walls dividing it from the master suite. Cut-out openings serve as art/plant shelves. 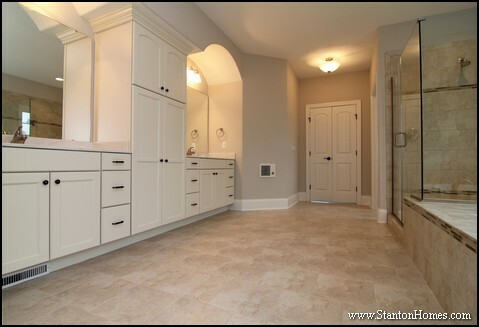 The his-and-hers walk in closets sit opposite each other, leading to the master bath. 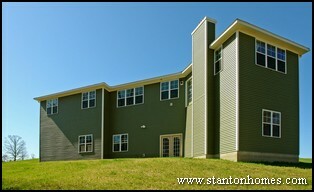 The Peay -- a Stanton Homes floor plan -- has 6 bedrooms split between the first and second floor. 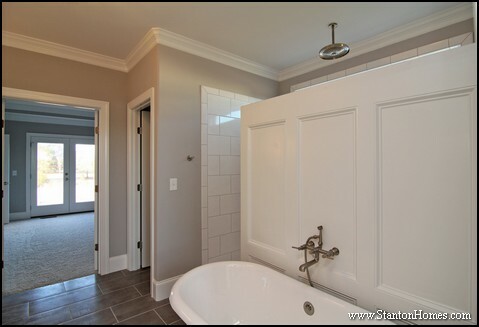 The master bath leads into the walk in closet with center island. 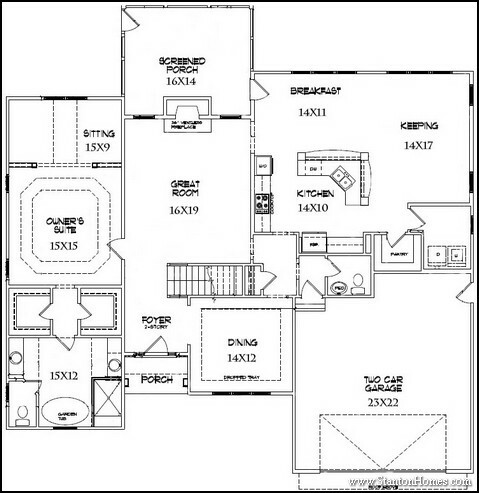 The Remington -- a Stanton Homes floor plan -- offers a downstairs master suite with sitting area, three sided fireplace, and his and hers bath with private closets. 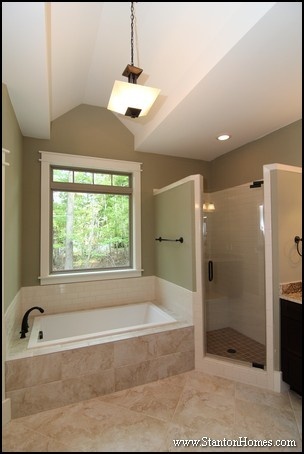 The master bedroom and bath feature ceilings with multiple heights, designed to emphasize the depth of large spaces. Homes with a downstairs master continue to be a top home buyer request. Get ideas for your next home, from these first floor master bedroom home plans. Then, tell us what kind of home you want to build in North Carolina. 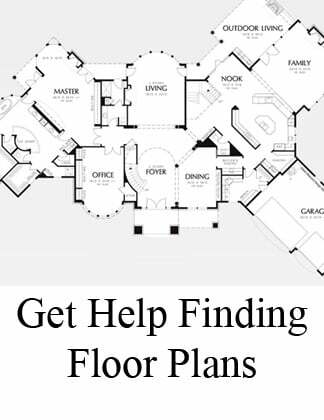 Need more help finding a floor plan? Check out these photo tours. 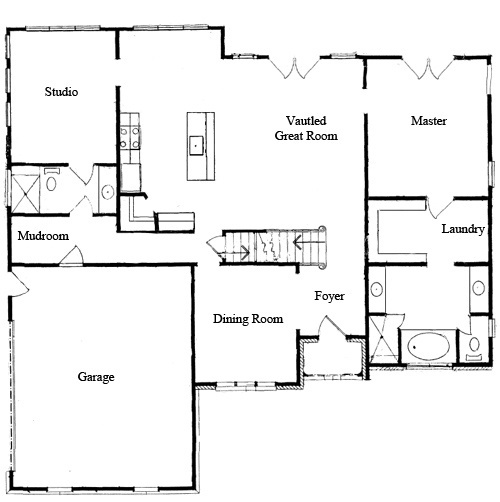 Or browse main floor master floor plans here. How much are property taxes in Johnston County NC? 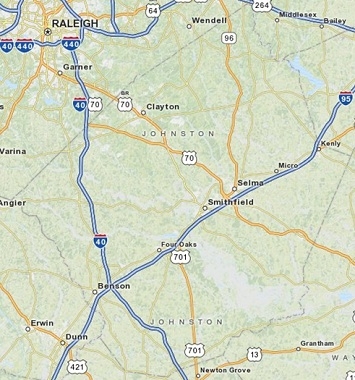 Where is Johnston County, NC located? Johnston County borders Wake County on the southeastern side. Clayton is about 17 miles from the center of downtown Raleigh. When were Johnston County NC property values last adjusted (assessed)? Johnston County revalues all real estate at least once every eight years, per NC requirements. 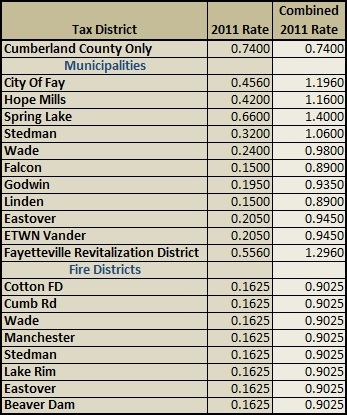 The chart below shows the 2011 Johnston County property tax rates. If you are relocating to a home inside a town or fire district, the tax rate will generally be higher. If your new home will be outside of town boundaries, the tax rate can be low. For example, Clayton has a town rate of 0.525, and the Johnston County property tax rate is 0.78. Add the two together - the total tax rate for Clayton, NC is 1.3050. How Do I Convert Clayton, NC Property Tax Rates to the Amount I'll Write a Check For? 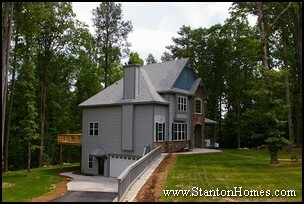 For 2011-2012, tax rates can vary from 0.78% (Johnston County only) to 1.39% (Kenly, NC). There is no guarantee that tax rates will remain the same - check the Johnston County Property Tax Rates for most recent information. 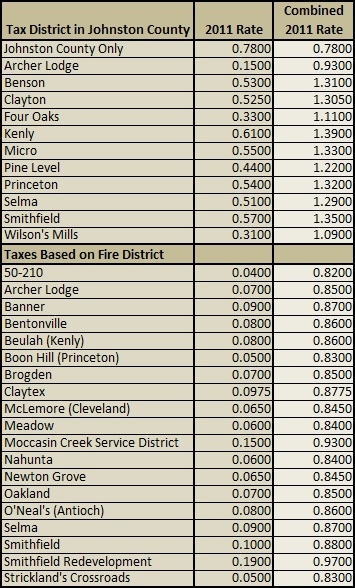 And just to give you an idea, here's a table of sample yearly tax payments for different sample assessed home values - for all the cities in Johnston County, including Benson, Clayton, Four Oaks, Kenly, Micro, Pine Level, Princeton, Selma, Smithfield, and Wilson's Mills, as well as some of the rural areas surrounding each of these towns. 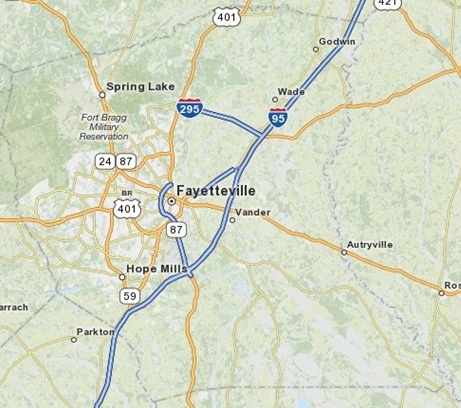 What If The Johnston County Home I'm Considering Isn't Inside City Limits? Your tax bill can be lower if your home or property is not actually within a municipality, or town. If this is the case, you'll pay just the County rate, plus a fire district or other rate. If there's a particular address you're considering, you can see the exact assessed value of the home and/or property - just enter the address here. 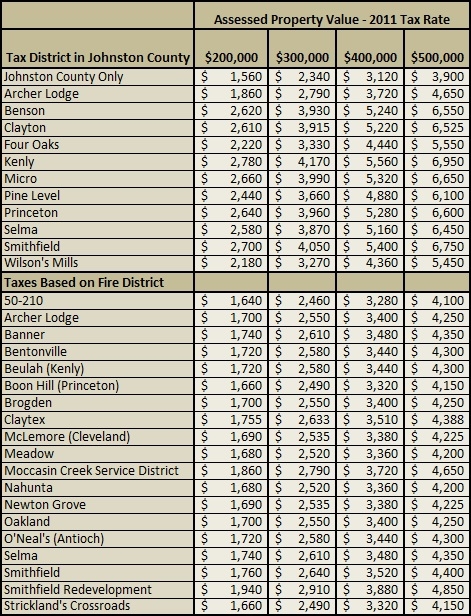 It is possible that there are fire district rates in addition to town rates, so it does help to look up a particular address. But in general, the tax rate tables above work well to estimate taxes. How Do I Know If I'm In Johnston County? When looking at properties, don't take the city address for granted - you could be in a different county, with different tax rates, depending on where exactly the property is located. Ask your agent to verify the actual address and county before you sign a contract. Clayton - a Clayton address could be in Wake County or Johnston County. Wendell - a Wendell address could be in Wake County or Johnston County. Property taxes are based on assessed value, not the price the home is sold for. The assessed value you see may be either higher or lower than the asking value of the property - it really depends on how long ago the assessment was made, and what improvements have come to the area since the assessment (or what improvements are planned for the area). If there is a discrepancy, don't be afraid to ask your real estate agent to pull comps for you! 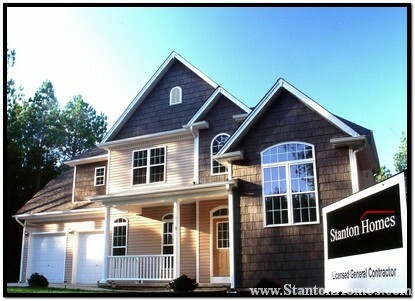 Raleigh, NC Basement Home Options | How Much does a Basement Cost? How Much do Basements Cost in Raleigh, NC? How do I find a basement home in the Triangle? 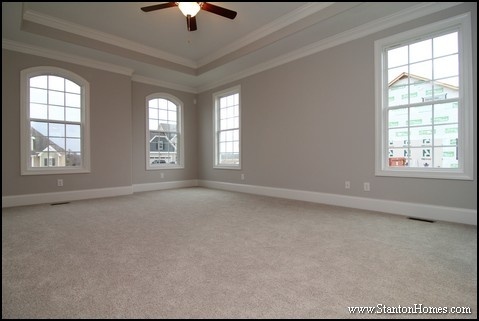 If you're looking for a basement home in the Raleigh NC area, chances are really good that you'll be considering a "walk out" or "daylight" basement. Because of the high water tables and high water content of the soil, many builders will not take liability for a basement that is fully underground. Without drainage, water leakage is much more likely to occur at some point, even with extensive sealing. What is a daylight basement? A daylight basement usually has at least one fully exposed wall that looks just like a "normal" house. To build a daylight basement home, you'll need a lot with some slope to it - an ideal slope will have anywhere from 8 to 12 ft in height difference between the front of the home and the back of the home. Of course, a lot with more or less slope can also work - but the more the dirt needs to be moved around to accomodate the home, the higher the cost is likely to be. The front of the home will look like a standard one or two story home. From the rear of the home, the basement will be visible as an additional story. French doors, sliding doors, and windows can provide plenty of natural light for the basement. Many basements are unfinished at the time the home is sold. The homeowner can finish the space later, and save money either by doing some of the work themselves, or by paying cash rather than financing the cost of the additional finish work. 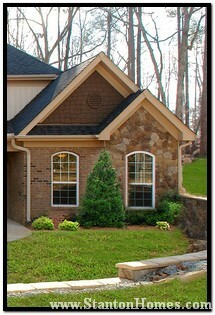 What type of foundation walls are used for basements in the Raleigh NC area? In some areas of the country, poured foundation walls are very common. In the Raleigh area, the most common type of basement foundation wall system is precast concrete, from a specialized subcontractor like Superior Walls (Basement Homes Raleigh NC). 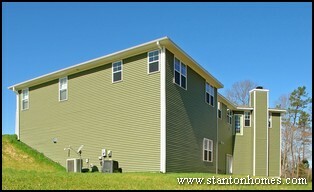 A Superior Wall system is carefully calculated for each individual home. The type of soil, load bearing weight, load bearing columns, exterior finish, and locations of windows and doors can all have impact on the foundation wall construction. How Much Does a Basement Home Cost in the Raleigh, NC area? - Is the basement the same size as the first floor, or is it smaller with a combined crawlspace foundation? -Is the lot suitable for a basement home (ie enough slope for a daylight basement), or will some modifications be needed? - Do you want a finished or unfinished basement? - How many and what type of windows and doors are planned? - How large of a deck will be attached to the first floor, extending over the daylight basement? 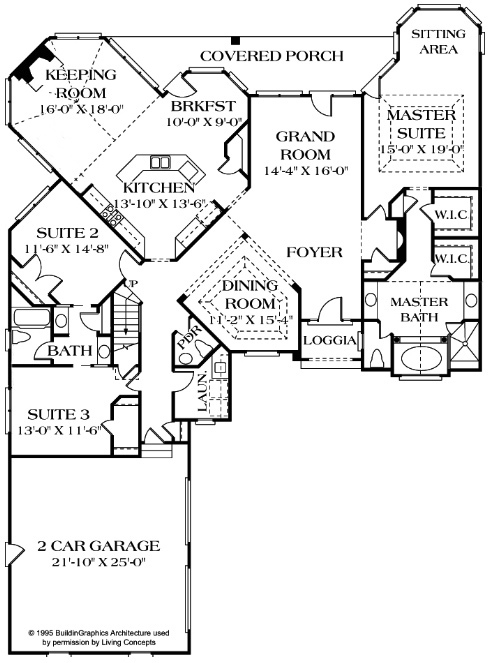 We provide free building cost estimates, specific to your favorite floor plan from www.FrankBetz.com, www.MonsterHousePlans.com, www.HousePlans.com, or any other site. Just contact us, and send us a link to the floor plan you love! 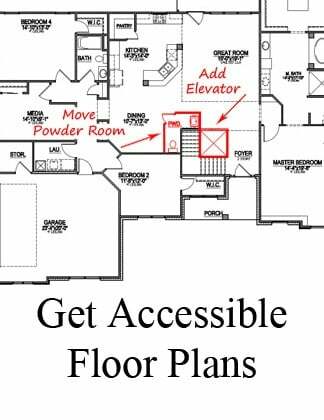 Don't have a floor plan yet? We'll help you find one, from any of thousands of available options. How much are property taxes for Durham County NC new homes? Where is Durham County located? Durham County sits between Chatham County, Orange County, Person County, Granville County, and Wake County. 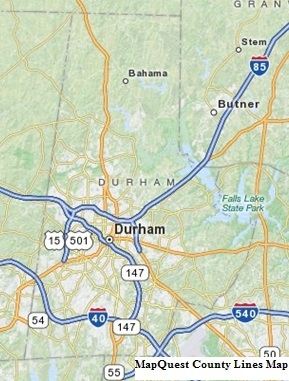 Durham serves as one of the corners of the Research Triangle Park, along with Chapel Hill and Raleigh. When were Durham County NC property values last adjusted (assessed)? All North Carolina counties are required to conduct a revaluation at least once every eight years. Durham County was reassessed on January 1, 2008, and the new assessed values went into affect in Summer 2008. 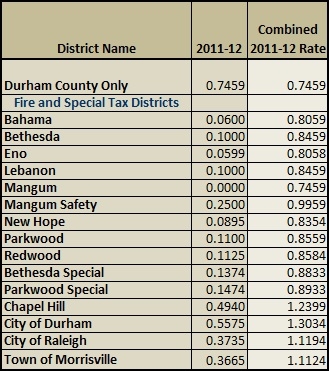 The chart below shows the 2011 Durham County property tax rates. If you are relocating to a home inside a town or fire district, the tax rate will generally be higher. If your new home will be outside of town boundaries, the tax rate can be low. 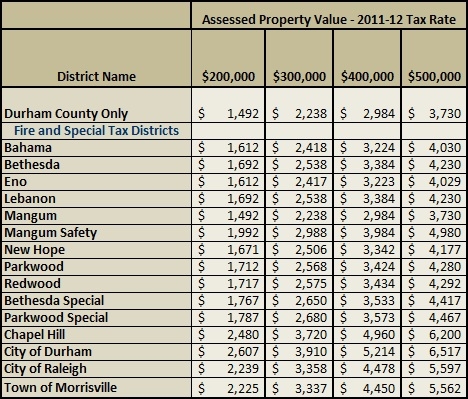 The Durham County property tax chart is not as confusing as it looks. The tax rates are always based on the assessed value of the home, not the asking price, so you'll want to look up the assessed value, or ask your agent for it. For example, Chapel Hill has a town rate of 0.494, and the Durham County property tax rate is 0.7459. Add the two together - the total tax rate for Chapel Hill, NC is 1.2399. This table gives sample property tax bills for all the cities and towns in Durham County, NC: Durham, Chapel Hill, Raleigh, Morrisville, Bahama, and more. Your tax bill can be lower if your home or property is not actually within a municipality, or town. You can also visit the Durham County Property Tax page to get the most up-to-date tax tables or tax information for the City of Durham. 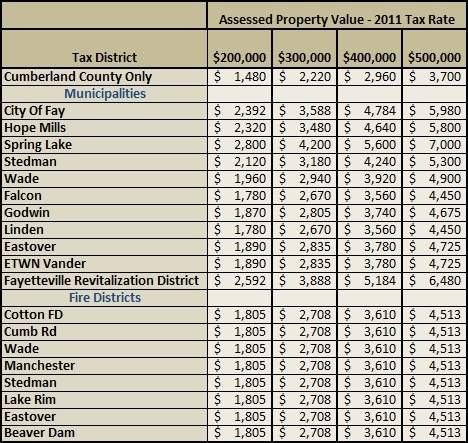 As you can see, a City of Durham location will be the most expensive property tax location to live in Durham County, following closely by the City of Chapel Hill. How Do I Find Out the Assessed Value of My Durham County Home? If there's a particular home that you're considering, you can go directly to the Durham County Tax Administration Records site, type in the address, and see the assessed value of the property. What if the Assessed Value is Different From the Sales Price? If there is a discrepancy between the assessed value and the asking price of the home or lot, don't be afraid to ask your real estate agent to pull comps for you. Assessed values are not always aligned well with market values, as assessments are often made several years apart. Types of Tile: What Kind of Tile Should My New Home Have? What's The Difference Between Different Types of Tile? Tile can be found in many different areas of the home. 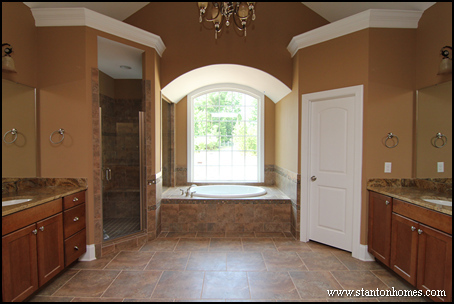 Some custom homes have secondary bathrooms with tile floors and tile tub surrounds with a porcelein or steel tub. Tile floors can be found in kitchens, breakfast rooms, laundry rooms, even occasionally on patios or foyers. Fireplaces are another common place to find tile - a tile hearth and surround gives a polished feel to today's gas fireplaces. What's the best kind of tile to choose? There are many different kinds of tile available today. Ceramic tile is most commonly used, but it's useful to know all the basic tile types. Ceramic tile is known for its durability, resistance to dampness, affordability, and ease of cleaning. It's safe to walk on when wet. Sealant should be applied every 4 years or so, but when sealant is properly applied tile is very water tolerant - you could even hose it off! Made from slabs of clay, ceramic tile is fired for hardness. Check before using ceramic tile outside - it needs to be extra strong to tolerate expansion and contraction from temperature changes. Glazed or unglazed, smooth or textured, and available in a wide variety of colors and styles, ceramic tile is the builder's choice for most tile floors, walls, or accents. Natural stone - quarried slate, limestone, flagstone, granite, or marble - can be cut into tiles, even though all of these are better known as full countertop materials. Each has it's own pros and cons - for instance, marble is known for its beauty, but it is expensive, requires a lot of maintenance, and can crack, stain, or mark easily. No wonder they don't let us touch the marble statues at the museum! Slate is noted for its beauty and long life, but it is soft and can split. Granite is durable, dense, and strong, but is mainly formed into basic tiles with few additional options. Natural stone is also one of the most expensive types of tiles, and some materials require more care and sealant due to natural permability. Because these stones are created in nature, no two rooms will ever look the same. Cement tile is created by pouring cement into molds, then finished by firing or natural drying. Color may be added. A strong sealant must be applied in order for cement tile to resist stains. This type of tile is not as common. Porcelain tile is made from material similar to that used for ceramic tile, but it is fired at a very high temperature, which makes it denser and more resistant to moisture. It is fine grained and smooth, and can be matte, unglazed, or highly polished. It is stronger and more durable than ceramic tile. As better processes for creating porcelain tile are found, it is becoming less expensive and more common. Terrazzo - a cement or epoxy base is used, in which stone or marble chips are imbedded. The surface is then highly polished. Terrazzo is known for its unique beauty, style, and permanence, but it is expensive and can be somewhat slick to walk on. Saltillo (Mexican tile) - these tiles are generally handmade and air dried, thus they are a little softer and less durable, but with a unique look from exposure to elements. When used indoors, the tiles must be sealed - some come sealed from the manufacturers. Terra Cotta - think of "clay garden pots", and you'll have an idea of the natural rich reds and oranges from the clay base. These tiles are absorbent, and most often used on patios. They must be sealed for indoor use. Be careful, there are wide variations in quality. Agglomerate - Another textured tile, created by mixing graded marble or granite chips with portlar cement, polyester resin or epoxy. Glass mosaics - These are becoming very popular. In shades of blue, green, brown or even clear or translucent, glass mosaics provide a unique, if not natural, look. These tiles usually are ¾"x3/4", and come in sheets roughly 12"x12" for application. This look can be expensive, but glass tiles can also be coordinated as medallions or accents with full size ceramic or other tiles. A luxurious tile floor, shower, or bathtub surround provides long lasting beauty and durability in any home. Visit tile showrooms for ideas if you're building from the ground up or remodeling, or ask your local builder if they will work with you to provide just what you're looking for. What is a Craftsman style home like? Formal Dining Rooms - Going Away, or Here to Stay? Custom Home Tips: Love the floorplan, hate the exterior? Change it! 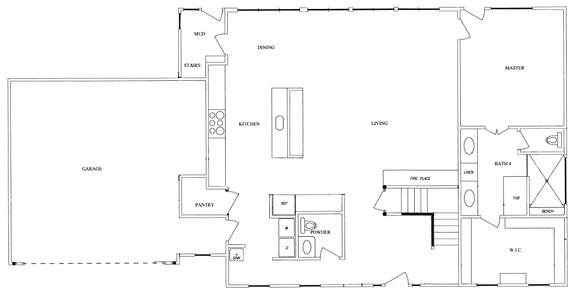 "The floorplan I like packs lots of usable space into less square footage. But the exterior looks a little blah. 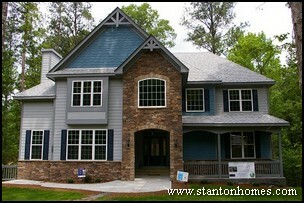 Is there a way to keep the rooms the way they are, but change the exterior of the new home we plan to build in Raleigh?" Buyers looking to economize are asking for smaller new homes in Raleigh, NC. But if you’re building a custom home, there’s no reason to give it a cheap-looking exterior. 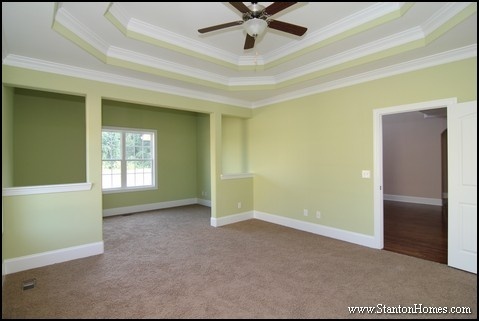 Here are some ways that new home builders in NC dress up your new home without breaking the bank. Change the roof lines. Add a dormer. Steepen the roof’s pitch. Change the slope. The result can be dramatic. Add stone or brick accents. Just a touch of additional materials can make a big impact. Change the shape of the windows. A transom, or half round window, adds personality. Every window doesn't need to be expensive, but one centerpiece window can make a big difference. Change the location of the windows. This could also have the additional benefit of providing more space for furniture where you really want it. Add more windows, or remove some windows. Consider a family room that doubles as a sunroom. 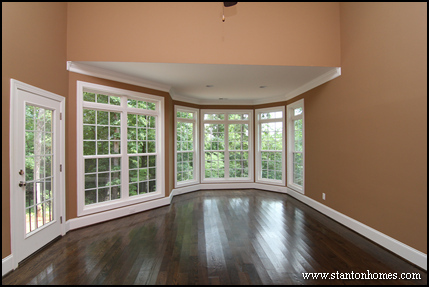 Eliminate additional cost by simply moving windows from one room to another. Change from a country look to a Craftsman look. Or convert a traditional exterior to a Farmhouse. You’ll have to see this on paper to realize how much it will change the way your new home looks. New homes in Raleigh, NC vary widely in how they’re designed, so you’ll have to check with your new home builders in NC to find out exactly how much you can vary your plan. 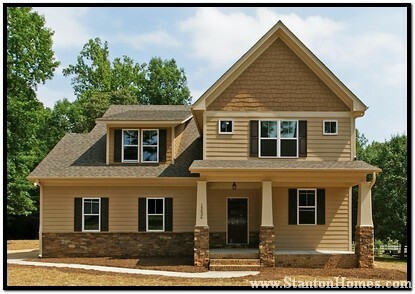 Top local new home builders like Stanton Homes can tell you what your options are, just by looking at the plan you have in mind. They’ll sketch out some alternatives, at no cost, to show you how it will look. 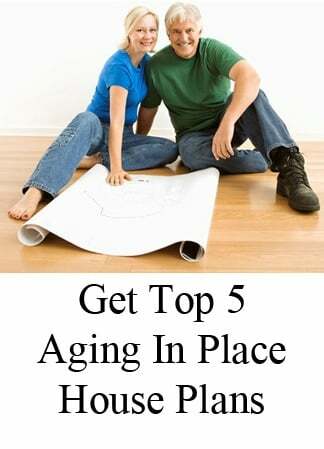 And you won’t even have to buy the plans you have in mind for an initial evaluation – they can give you an idea from a computer screen printout or photocopy from a home plan book before you make any purchases. 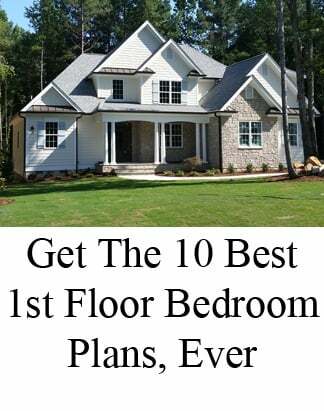 If your new home builders in NC offer a free consultation like this, take advantage of the opportunity to consider all your options. When you’re ready to build, you’ll have the confidence that your new homes in Raleigh, NC will be more than just custom-built. They’ll also be custom-designed – and you’ll have a hand in it.